Happy Sunday! It's time for another Sunday Scoop, hosted by Teaching Trio! I am a busy gal at work these days! There are so many exciting things about to happen! 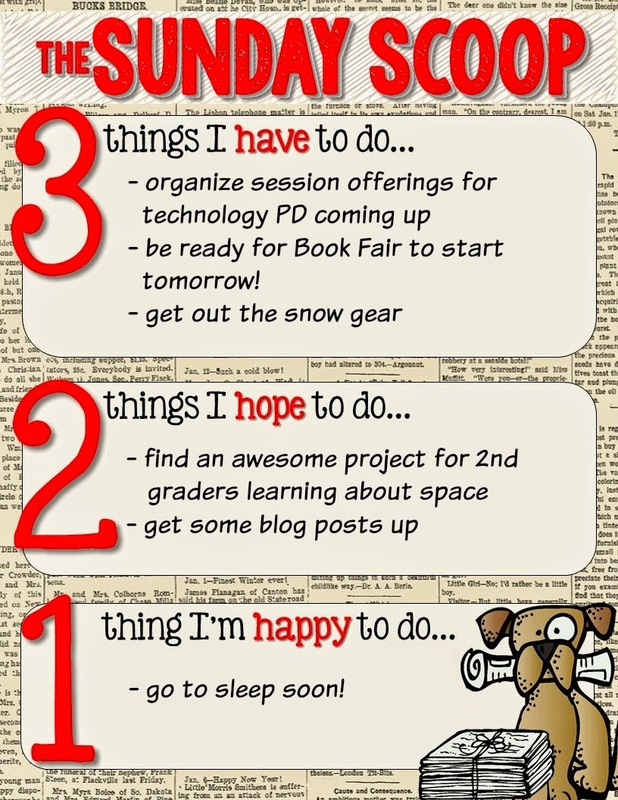 We have a technology in-service morning coming up that I am planning. We will have sessions presented by our own staff on topics like Google Classroom, Moodle, ePortfolios, QR codes, and so much more. I love these mornings! I am on to Book Fair #2 of the year and the kids will be so excited in the morning! I do 2 Book Fairs in fall and 2 in the spring, for a total of one fair at each of our four elementary buildings. It snowed up north this weekend and we are supposed to get a good storm tomorrow! I love snow! Woohoo! If you have ideas to share on a techie science project for second graders about space, I'd love to hear it! I found you through Sunday Scoop! Good luck on technology in-service day! I love Google Classroom. I use it ALL the time! QR Codes still have me stumped on how they work. I use them all the time but I am mystified by them! :) 4 book fairs! Wow!!! That sounds like a lot of work!! Thanks for linking up with us and I hope the rest of your week goes well!